Hello and welcome to the first newsletter highlighting this year's CIO Association signature event: the 2017 CIO Peer Forum. As co-chairs of this year’s conference, Mussawar and I are excited about the program we have put together, along with the incredible speaker lineup. Digital Transformation, 4th Industrial Revolution, and Digital Disruption are just some of buzzwords that fill our inboxes on a daily basis. However as leaders in this new digital world, how do we create the digital business? There is a gap between concept and reality, so we have created a program that will help close that gap and give you tangible insight so that you can create your own digital business. As the CIO role continues to evolve, we need to evolve with it, expanding our professional scope and personal development. Through this newsletter series leading up to the Peer Forum, you’ll find teasers of the topics that will be covered by thought leaders and practitioners. I invite you to check out the full program and register to join us and other colleagues in two days of learning, networking and sharing of best practices. I look forward to welcoming you to Edmontion for the CIO Peer Forum 2017.
in online dating with over 2,000,000 users (and countless successful marriages!). After its spectacular rise and with the support of his partners, he led the sale of the company for a stunning 180 million dollars. Bruce is now taking his expertise to a new level; he currently helms Round13, a company dedicated to investing in growth-stage digital companies like Sprigg Software and Round Assist. He also peruses personal investments in the health and wellness sector, owning Vida, a chain of high-end holistic spas on the west coast of Canada. Most recently, he invested in FEAST, an allergy-friendly fine food store based in Toronto. 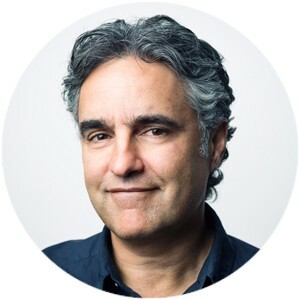 As an investor on CBC’s Dragons’ Den for three years (2011- 2013), Bruce added a broad range of businesses and products to his portfolio including Balzac’s Coffee and EnRICHed Academy, which tap into his passion for digital media, marketing and contributing positively to the community. Bruce loves to speak to entrepreneurs and share his experiences. With 20+ years of helping young companies grow and 3 years investing on CBC’s Dragon’s Den, Bruce has a wide range of deal exposure and practical advice. Bruce gives particular importance to the visions and values required to grow organizations in a fast moving business environment. We are delighted to have Dave Mowat, President and CEO of ATB Financial speaking at the upcoming CIO Peer Forum in Edmonton April 26-27, 2017. Dave is re-imagining ATB Financial to drive innovation and digital transformation. As such, a new style of leadership and roles are being created to meet that vision. 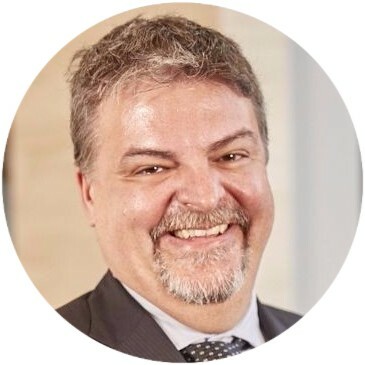 A key leader on Dave’s impressive executive team is Lorne Rubis, now the Chief Evangelist at ATB Financial. Business is continually evolving. Every enterprise is going to have to fundamentally rewrite the way they work in a digital world. This means the culture of a company, the way in which people collaborate both internally with team members and externally with customers, will all have to adapt to stay competitive. For the people within an organization, a customer-centric mindset should be at the heart of guiding principles during transformative moments in a company’s cultural evolution. An information-based economy presents a real challenge for privacy law. The law requires the protection of personal privacy, while economic and other social imperatives push us to work to reap the economic and social benefits of a fully-connected, Big Data world. We cannot ignore privacy law, and we cannot stop the Big Data revolution. We must find a way to reconcile the tenets of privacy law with technological innovation. I use the term Big Data is to describe the large quantities and varieties of data that are available to be processed and to be analyzed to draw inferences and conclusions. Big Data analytics requires data, algorithms, and physical platforms, such as data centres, where the data is stored and analyzed. But Big Data stores can be hacked, and their contents used for inappropriate or nefarious purposes. Security services are an essential component of the Big Data infrastructure. The sources of information for Big Data are everywhere – internet use, social media, mobile applications, government and commercial databases, the many internet connected devices that collect data from the physical environment (the Internet of Things or IoT), GPS chips, in-person payment transactions, and so on. There are some truly remarkable benefits that can be derived from Big Data. For example, in 2013, Toronto’s Hospital for Sick Children, the University of Ontario Institute of Technology (UOIT), and IBM Canada synthesized millions of data samples from monitors in neonatal intensive care units and were able to identify factors that serve as early warning signs of life-threatening infections for newborns. pathways for organizations to create value. We believe digital is broad in its impact, but also industry-specific. It goes far beyond the front office to facilitate true enterprise-wide business transformation so organizations can build sustainable competitive advantage. While we understand that embracing digital may present its own challenges, we view disruptors as enablers rather than inhibitors, allowing businesses the opportunity to innovate, transform and thrive. Thank you so much for your sponsorship of the CIO Peer Forum coming up April 10-11, 2018 in Vancouver. We are glad to have you on board as a sponsor. The following information will help you to plan and execute your sponsorship deliverables. Our room block is the traditional rooms at a rate of $289 single or double occupancy. The cut off date for reservations is March 16, 2018. Reservations can be made via phone at 1-604-682-3377or online. • Immediate: Your logo, both in eps or other high resolution format at 300 DPI minimum for print publication, and in gif, png or jpeg format for electronic media. The sooner we can get these, the more exposure your company will get as we promote the event. • Immediate: Your company’s URL, so that we can put a link to your website from the CIO Peer Forum site. • Immediate: Your company’s social media handles (all that you use). • Immediate: Your company profile. Please consult your contract for the number of words you are entitled to. • Deadline: March 16, 2018. You are entitled to complimentary registration(s) for the full conference. Please consult your contract for the number complimentary registrations to which you are entitled. If your sponsorship includes a speaker on the program, your speaker is over and above the complimentary registrations in your contract. A spreadsheet will be emailed to you to facilitate submission of your guest details. Any registrations not claimed by March 16 will be forfeit. CIOCAN staff and volunteers are not responsible for set up, tear down or shipping of your materials. Any items that have not been packed up or shipping arrangements made at the end of the event, will be left at the venue. Your sponsorship entitles you to a business card draw. Please advise us no later than Friday, March 23, 2018 if you are going to provide an item for a draw and what it is so that we can schedule the draw into the program. Come prepared with a container in which to collect the business cards. We strongly suggest that you bring a sign to go beside your container with a picture of the prize and your company logo. All items must be present on site to be eligible. Draw items are the responsibility of the sponsor and will not be held or stored by CIOCAN staff or volunteers. Items should be of a size and weight that make it possible for delegates who travelled by air to win. Each sponsor offering a draw should designate which of their representatives will be responsible for keeping the prize, and managing the draw on stage. Closer to the event, each sponsor participating in the draws will be given a designated day and time when their draw will take place. If you have sponsored a coffee break, meal or the reception, you are entitled to place banners in the area where the food will be served. You are responsible for providing, setting up and removing the banners at the appropriate time. CIOCAN staff and volunteers are not responsible for set up, tear down, shipping of your materials. Any items that have not been packed up or shipping arrangements made at the end of the event, will be left at the venue. If you choose not to bring banners, then the conference will provide signage. • Deadline: Immediate. You are entitled to recommend a speaker for a breakout session, subject to topic and speaker approval by the Conference Co-Chairs. You need to complete the speaker information form as soon as possible to ensure inclusion in our marketing campaign. • Deadline: March 16, 2018. To help you ensure that the content direction is the best fit for our audience, a conference call with the speaker and our Event Co-Chairs will be arranged at a mutually convenient time. Audience Demographics: The event will bring together a community of CIOs and IT industry leaders, combining forces with experts, thought leaders and practitioners to explore, discuss, and learn. All sessions are aimed at providing attendees with actionable information that can create positive and immediate impact on their organization. We want to help our audience become more effective information technology leaders, opening the door to new perspectives on business success. Reception and Diamond sponsors are entitled to host a cruiser table at the cocktail reception. A draped table will be placed in the reception area for your use. You may bring a banner to place beside the table, and use the table for either literature, business card etc. Only one cruiser table per sponsor is allowed. 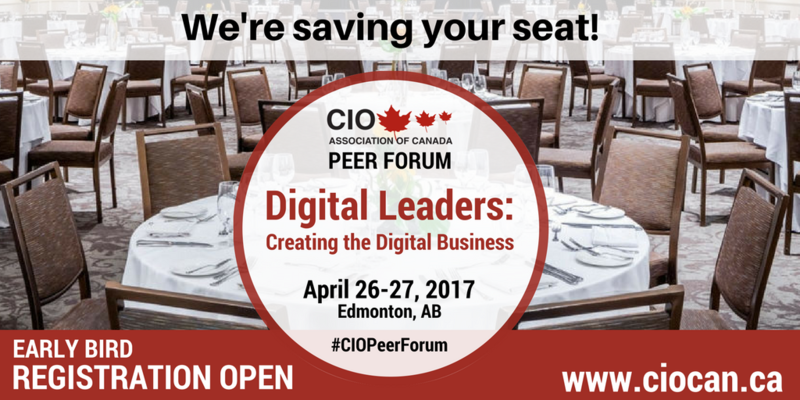 The CIO Peer Forum is a unique opportunity – an annual opportunity to learn new leadership approaches, and network with your peers in ways that will challenge you - that will enable you to manage the rapidly changing landscape more effectively. IT as merely a trusted operator is no longer sufficient; organizations are looking for IT to be change agents, business partners, and ultimately, innovators. Rather then being reactive to the business strategy, the new mandate of the CIO is to get ahead of business strategy, to identify how emerging technology and trends will affect the business model, and to leverage or develop these technologies to create new markets and competitive differentiators to drive bottom line results. So, how do we move from being order takers to business enablers pulling the business forward and predicting what comes next? Changing the role of IT, and changing our colleagues’ perspectives of what IT can and will do for business, will require that traditional models be abandoned or changed and a new progressive way of thinking be adopted. We have to be truly fused with the business and make our CEOs and boards realize that they need IT to be at the helm, or risk being swamped by the tidal wave of digital disruption. The CIO role has great visibility across most organizations, and is uniquely positioned to lead digital business strategies. However, it might be time for a check-up. Is your IT strategy constrained by the overall business strategy? Is it 5 – 10 years old? How do you get ahead of the strategy to create innovation through new technologies that can drive a competitive business advantage and respond to customer demands? Large scale hacking and ransomware have upped the ante on cyber security. Prevention requires that knowledge of the risks and training in best practices become part of the company culture. All business leaders need to understand the dangers of ignoring the need for diligence in security practice. Many IT leaders grapple with recruiting and retaining the new generation of IT professionals. Often we are faced with legacy employees whose traditional approaches smother fresh ideas brought forward by newer hires. How do we create and sustain a culture that allows for innovation and new strategies? So what skills does the successful IT leader need to possess? Core technology skills are necessary but not sufficient. We need strong business acumen, the ability to engage, develop and retain our employees, understanding of organizational design and culture, and the knowledge of how to articulate and define business value. Then we need to know how all this helps to drive corporate strategic goals. 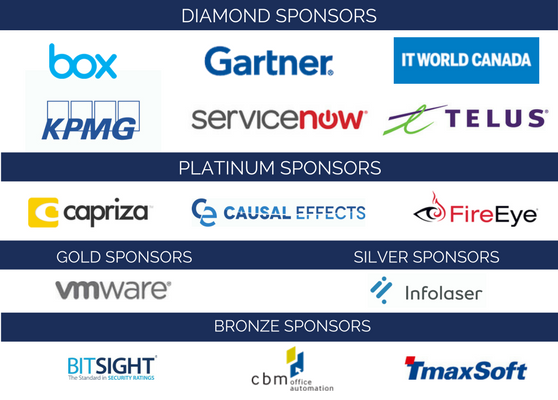 Join us in Vancouver at the 2018 CIO Peer ForumTM to gain the knowledge and insight to take your Senior IT Leadership role to the next level! There are also opportunities to participate. Perhaps you want to join our line up of speakers or become a sponsor. Thank you for accepting our invitation to speak at the CIO Peer Forum coming up April 10-11, 2018 in Vacncouver. The following information will help you to plan and execute your speaker engagement. Should you have additional questions, feel free to contact us. • Immediate: we need a headshot photograph in jpeg or png format, at least 300 pixels wide and scalable. • Immediate: Complete the speaker form that will provide us with your session title, descrption, biography and contact/social media information. • Blog Posts and Newsletter Articles: To help promote both the CIO Peer Forum and your topic specifically, we encourage speakers to submit a blog post of 500-800 words and a newsletter article of 800-1200 words. It can be something you have already published as long as it supports the topic you will present. • Social Media: The CIO Peer Forum is an extremely social event. We encourage you to join us on LinkedIn and Twitter. • Session Date and Time: Your session will have been confirmed via email. However, minor program adjustments may still be made as we go along. You will be notified of any changes via email. • Conference Attendance: As a speaker you are invited to take advantage of a full complimentary registration to the entire conference. The complete program is published on our web site at www.ciocan.ca. We encourage all speakers to take advantage of this opportunity. You do not need to register this will be done automatically for you. • Deadline: March 16, 2018. To help you ensure that the content direction is the best fit for our audience, a conference call with the speaker and our Event Co-Chairs can be arranged at a mutually convenient time. Please let Alison Toscano know if you would like to do this. • Changes to your Presentation: If you have last minute changes to your presentation, please bring this on a memory stick. For guests staying in the hotel, please register parking at the Front Desk at check in. • Arrival Time: Please make arrangements to arrive at the break preceding your session to allow for audio visual set up and orientation. • Dress Code: Business attire for speakers. Attendees attire is business casual. • Emergency Contact Information: If you are running late or have an emergency, please contact Alison Toscano at 647-879-4700. 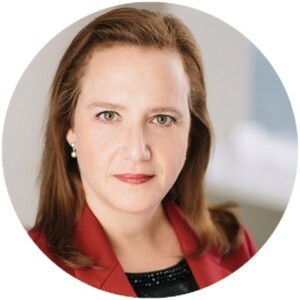 • Audience Demographics: The event will bring together a community of CIOs and IT industry leaders, combining forces with experts, thought leaders and practitioners to explore, discuss, and learn. All sessions are aimed at providing attendees with actionable information that can create positive and immediate impact on their organization. We want to help our audience become more effective information technology leaders, opening the door to new perspectives on business success. Rise to the Challenge . . . Someone Will!